Shahid Kapoor has always had a huge fan base. The actor’s team is constantly reached out by these fans who want to talk to him, meet him and share their stories. However, recently a fan ‘reached heights’ literally in her fanfare. 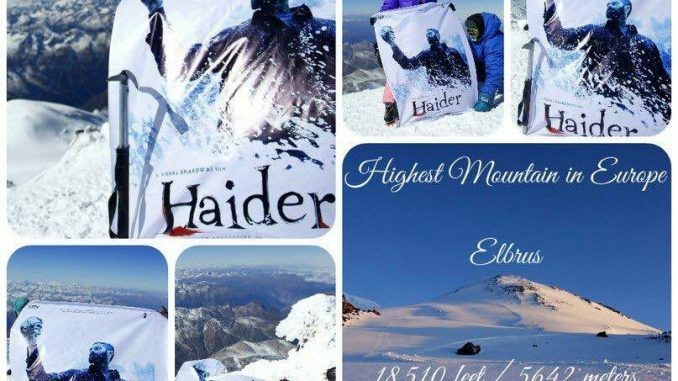 An NRI fan of Shahid went to the base camp of Elbrus (highest mountain in Russia, 18,510 feet above sea level) to hoist the Haider flag on top. While she inquired and shared her mission with trekkers at the base camp, they strongly advised her not to take the plunge. After a long conversation, she agreed for them to go hoist the flag. She started the trek with them and then patiently waited for them at a decided point. After the flag hoisting she has been trying to reach out to Shahid’s team and wanted to share the picture. Shahid was really humbled with the gesture and the love.